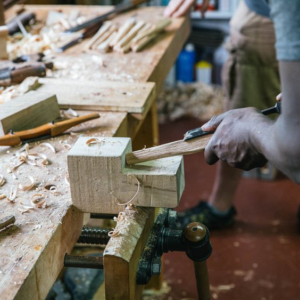 In this two-week course, students will be introduced to the foundations of furniture making. They will use hand tools and machines to construct two communal tables and accompanying benches for The New School. Most sessions will take place at MASS Collective. Transportation from TNS will be provided. Students may miss one or more sessions if they have pre-existing commitments. Robell Awake is a woodworker based in Atlanta, Georgia. 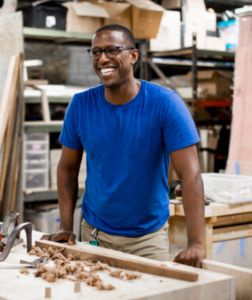 He works out of MASS Collective, a makers cooperative in Castleberry Hill. Passionate about traditional methods of wood working, he strives to craft each piece by hand, with minimal machine use. Robell grew up in Marietta, Georgia, the son of Ethiopian immigrants. After briefly living and working in D.C. and New York City, he returned to Atlanta where he worked as a bike messenger for several years, competing in alleycat races across the country. Inspired by the DIY ethos of the bicycle messenger community, Robell began building his own bicycles and began crafting “freak” bikes with his friends from salvaged bicycle parts and frames. He and his friends rented a warehouse space in Mechanicsville where they built out their bedrooms, a makeshift kitchen, and a stage for their friends’ bands to play on.